You can use the Veeam Agent for Microsoft Windows Control Panel to view information about backup cache activity. 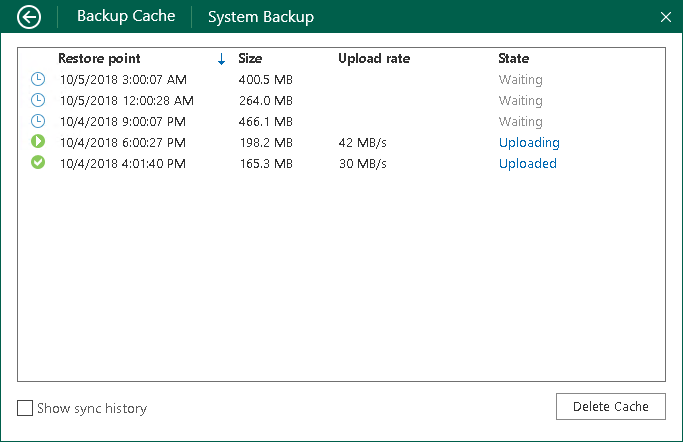 In the Backup Cache view, Veeam Agent for Microsoft Windows displays a list of restore points that were created in the backup cache, their status and size of the resulting backup file. 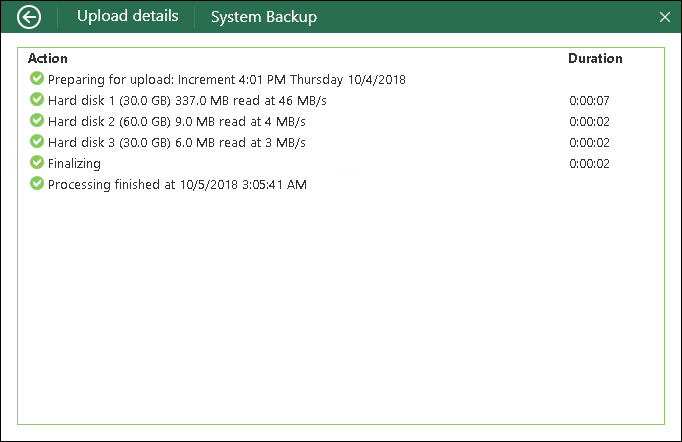 For restore points that are being uploaded or have been already uploaded to the target location, Veeam Agent for Microsoft Windows also displays the upload speed. Right-click the Veeam Agent for Microsoft Windows icon in the system tray and select View cache. The Veeam Agent for Microsoft Windows control panel will open, and you will pass immediately to the Backup Cache view. Double-click the Veeam Agent for Microsoft Windows icon or right-click the Veeam Agent for Microsoft Windows icon in the system tray and select Control Panel. In the main menu, hover over the name of the job that created restore points in the backup cache and select Open backup cache. 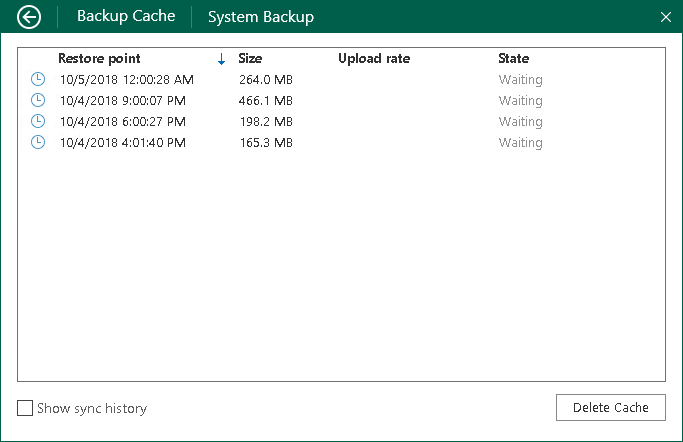 The View cache option is not available in the system tray menu if more than one backup job is configured in Veeam Agent for Microsoft Windows. By default, the Backup Cache view contains a list of restore points that are waiting for upload or currently being uploaded to the target location. Restore points that have already been uploaded to the target location are not displayed in the list. To view such restore points, in the Backup Cache view, select the Show sync history check box. [If the backup cache is enabled in the properties of one job] Right-click the Veeam Agent for Microsoft Windows icon in the system tray and select View cache. [If the backup cache is enabled in the properties of multiple jobs] Double-click the Veeam Agent for Microsoft Windows icon or right-click the Veeam Agent for Microsoft Windows icon in the system tray and select Control Panel. In the main menu, hover over the name of the job that created restore points in the backup cache and select Open backup cache. Uploading — for a restore point that is currently being uploaded to the target location. Uploaded — for a restore point that has been already uploaded to the target location. In the Upload details view, Veeam Agent for Microsoft Windows will provide detailed information about operations performed as part of the restore point upload process.